Kaifiyat Express derailment live updates: Union Railway Minister Suresh Prabhu said the injured have been shifted to nearby hospitals. No deaths have been reported as of now. 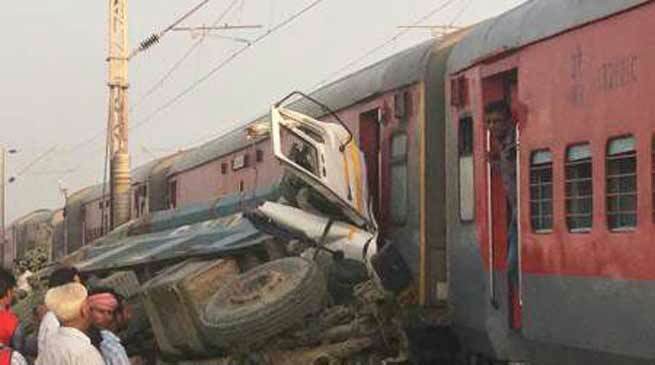 Over 70 people were injured after eight coaches of the Kaifiyat Express derailed and one overturned near Auraiya in Uttar Pradesh during the early hours of Wednesday. No deaths have been reported as of now. Kaifiyat Express runs between Azamgarh and New Delhi. The train met with an accident after a loader carrying sand overturned on road parallel to the track in Achhalda area of Auraiya district around 2.45 am. A NDRF team has been deployed to the accident spot to conduct rescue operations. The incident comes just three days after 14 coaches of the Kalinga Utkal Express derailed at Khatauli on Saturday killing 22 people and injuring dozens.